Helen and I are excited to start this QAL today! We've had this idea in our heads for quite sometime and finally thought we would do something about it! The idea for this QAL came from our love for traditional blocks. We LOVE TRADITIONAL BLOCKS!! I'm not sure why, maybe it's the history behind them.... maybe it's because our first quilts ever made were traditional block quilts. In any case we love them, which brings us to the QAL! We are going to take 12 traditional blocks and with the help of the Quick Curve Ruler (QCR) are going to "Curve them up"!! The first traditional block will be the Churn Dash Block. The QAL will go for 6 months. We will post a new block every two weeks which will give you (12) "Curve it up" blocks by the time you are done. Each block will measure at 16 1/2" before sewed which will give you a nice size "Curve it up" sampler block quilt. We will alternate the postings. I will be posting blocks 1, 3, 5, 7, 9 and 11 here on my blog and Helen will post blocks 2, 4, 6, 8, 10 and 12 on her blog. Again, a new block with the tutorial will be posted every two weeks. I've always wanted to make an orange and aqua quilt and thought this QAL would be a perfect time to do this. I've collected some yummy orange and aqua prints that I can't wait to cut into! 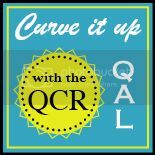 The "Curve it up" QAL will officially start, this Monday, October 22nd with the tutorial for the Churn Dash Block. Each block in this series will be simple enough for even the beginner quilter to do with ease. Here is a button you can add to your blog and to do this just copy the code below the button and add it as an HTML, in "add a gadget" in layout mode. Does this QAL sound fun? Well if you think it does but you don't have the Quick Curve Ruler (QCR), you're in luck! 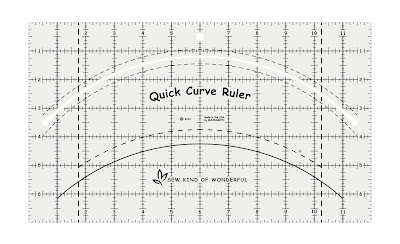 We are having a 3 day sale on the Quick Curve Ruler starting today and ending Friday at midnight. The ruler will be on sale for $19.95 and that includes free shipping within the United States. That's $5 dollars off the regular price! Just click on the QCR to purchase. We will ship out the rulers daily for the next 3 days priority mail, in order for you to get your ruler ASAP to start the QAL with the rest of us. We've created a Flikr Group for those of you joining. That way you can share anything from what fabrics you might be using.....your sewing progress.....and of course, your blocks as you complete them. Are you intimitated by curves? Really, you don't need to be! All the curves are cut with the use of the QCR. Each curve is a gentle curve, which makes it easier to sew each curve. Also, each block will be squared up to a nearly perfect rectangle or square using the QCR. The ruler's function is to make working with curves easier. You can also check out a you tube video here, if you want to see how to cut and sew the curves, then square them up. If we missed any details, or you have any questions, let us know. My wife was making her own cthras with a wood plank and some nice illustrations painted on them for our friends’ kids. The nice thing was that they were movable. Scribble, I like the tree growth chart, but it seems like $85 is a little steep for just a decal.